Following frantic work by his team, DeNofa made it to qualifying and scored 87 points on his first run. However, he was unable to complete his second run after the team discovered a more serious mechanical issue and withdrew the car. With his competitive weekend over, Chelsea joined the Formula DRIFT / AEM Halftime Show with Maximum Driftcast as a co-host and was able to give his personal perspective on the track and the unfolding action. 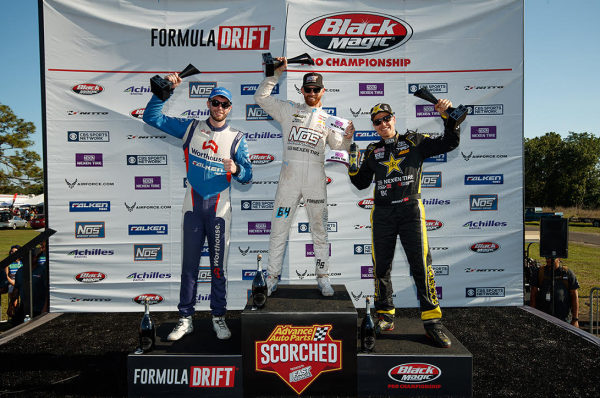 ORLANDO, Florida (April 29, 2018) – This weekend saw another podium finish for Fredric Aasbo as he snagged the top qualifying position and advanced through the Formula Drift competition ladder to score third place in the brand new Rockstar Energy Drink / Nexen Tire Toyota Corolla Hatchback. ORLANDO, Florida (April 26, 2018) – Fredric Aasbo is ready for the tricky Orlando Speed World track as Formula Drift makes its way east to the Sunshine State this Friday and Saturday for Round 2 of the 2018 championship. 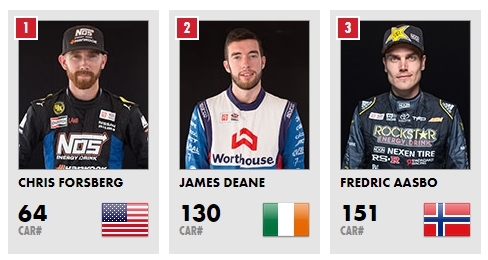 The driver returns to series competition after a strong start to the season. He drove his brand new Rockstar Energy Drink / Nexen Tire Toyota Corolla Hatchback to victory three weeks ago at the opener in Long Beach, California. The result raised his total career wins tally to 11 — more than any other driver in Formula Drift history. While serious engine issues and build delays took out drivers such as Dean Kearney and Taylor Hull, it was the never give up attitude of Kevin Lawrence that shined this weekend. He blew up two motors back in Florida in his proper built 240sx and grabbed the Enjuku Racing R32 Skyline at the last minute for a cross country drive to Long Beach. More mechanical issues hit the team and Kevin smacked nearly every panel on that poor R32 against walls in Long Beach but he kept going and took a loss in the Top 32 when most teams would have quit 16 issues ago.